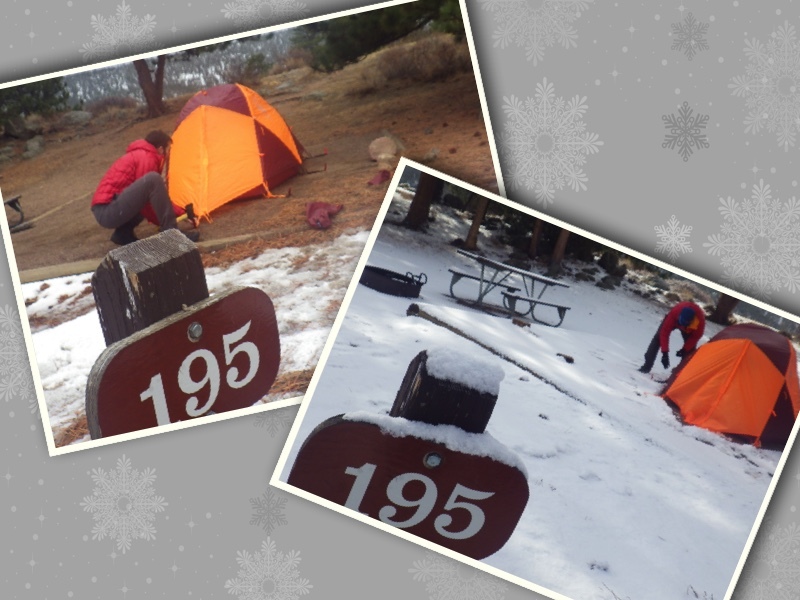 J & I went for round 2 of winter camping 101 by hitting up Rocky Mountain National Park in Colorado this week. I should clarify that J is very much into this winter camping thing, while I am still easing in and convincing myself that I like it. To be safe, we car camped at Moraine Park Campground. All things considered, we had pretty good weather ... for winter. We did not have to dig out a campsite in the snow this time, although some fell enough to crown our tent with powdered sugar. And, the wind was whipping our tent walls all night long. However, the temps only dipped to the 20s. Between our 4-season tent plus my -20 degree sleeping bag, I was prepared for the worst! 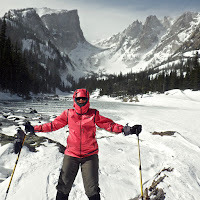 J's recent avalanche course took place at Rocky Mountain National Park, but this was my first visit to the park. 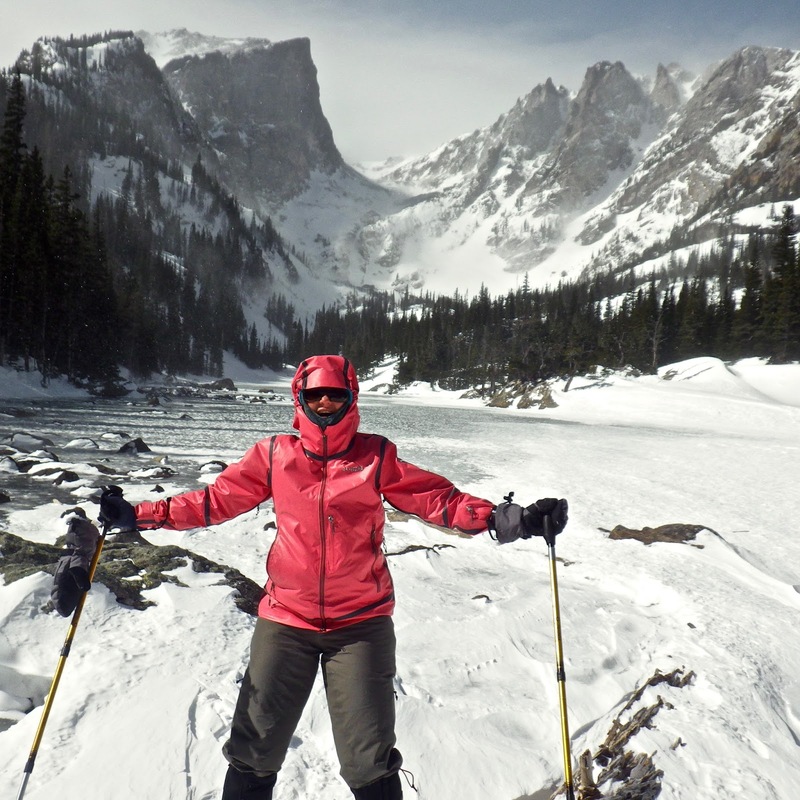 With 4 million visitors annually, RMNP is in the top 5 for most visited national parks. With overloaded parks like these, we opt to try to visit them during their off-season. It was still surprisingly busy for a midweek in the winter, but I am fully aware that "crowded" is not the appropriate term. While I know RMNP is known for hosting the peak of the elk rut (mating season) in the fall, I was not at all disappointed in our elk viewing opportunities. There was a gang of elk that hung out near our campground in Moraine Park every evening. No moose or bighorn sheep, but who can complain? 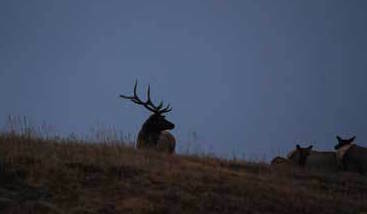 Elk are pretty cool in my opinion. Colorado's weather has been pretty vanilla lately (60s-70s in Denver! ), so at the lowest point in the RMNP at our campground (8,150 feet), there was very little snow. But as we climbed up to the subalpine forest surrounding Bear Lake at 9,475, everything was covered in that powdered sugar. We did 3 hikes on winter-friendly trails and we actually only needed snowshoes on one of them! The trail up to the subalpine lakes (Bear Lake, Nymph Lake and Dream Lake) was mostly wide and well-packed because of all the traffic. Once above treeline, the brows of 12,713-foot Hallett Peak, 12,324-foot Flattop Mountain and 14,259-foot Longs Peak stand sentinel on the horizon, giving you views the whole time. We stopped at Dream Lake. Our intention was to make it to Emerald Lake, but the stinging pellets of snow on the little skin we had exposed and gale-force winds blowing gusts of 50mph literally prevented us from moving forward. The pictures won't do it justice, but Dream Lake was just beautiful. It almost seemed like the choppy lake had frozen mid-whitecap, creating a ripple effect captured in ice. If the weather wasn't so harsh, we would have liked to stick around longer up there. A series of switchbacks take you up to a loop around Bierstadt Lake. The view of the Continental Divide was socked in by clouds on our way up, but the skies cleared for our way down. The trail through the stands of pines and aspens around the lake was pretty distinct, although a lot of people come out of the trees and just walk directly on the bank of the frozen lake. 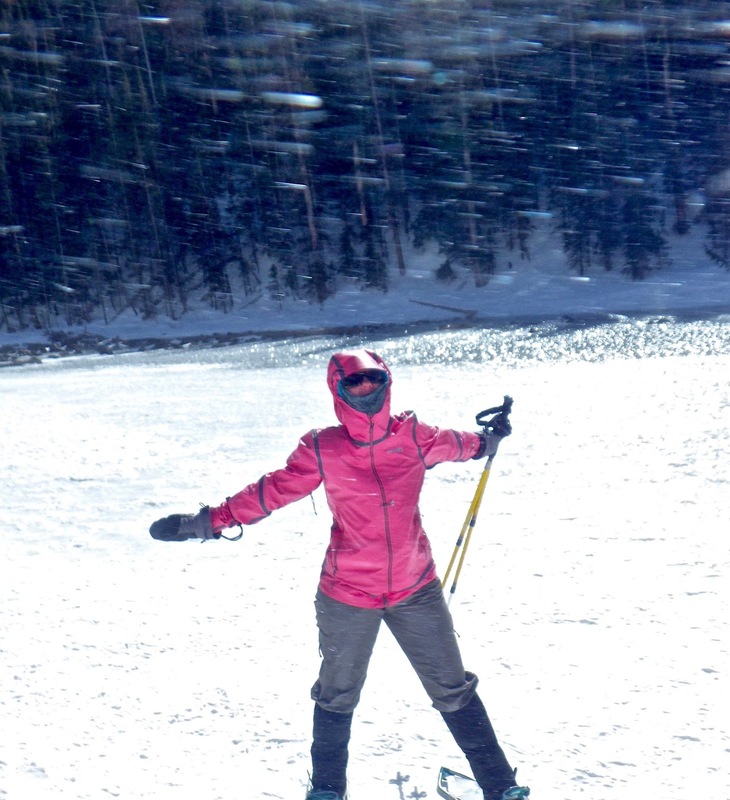 As you can see in the pic, there was only one spot with deep snow where I wish I hadn't abandoned my snowshoes! This trailhead is closer to the Moraine Park Campground. Because of the lower elevation and relatively flat path that follows Big Thompson River, the trail was not really snowy at all. 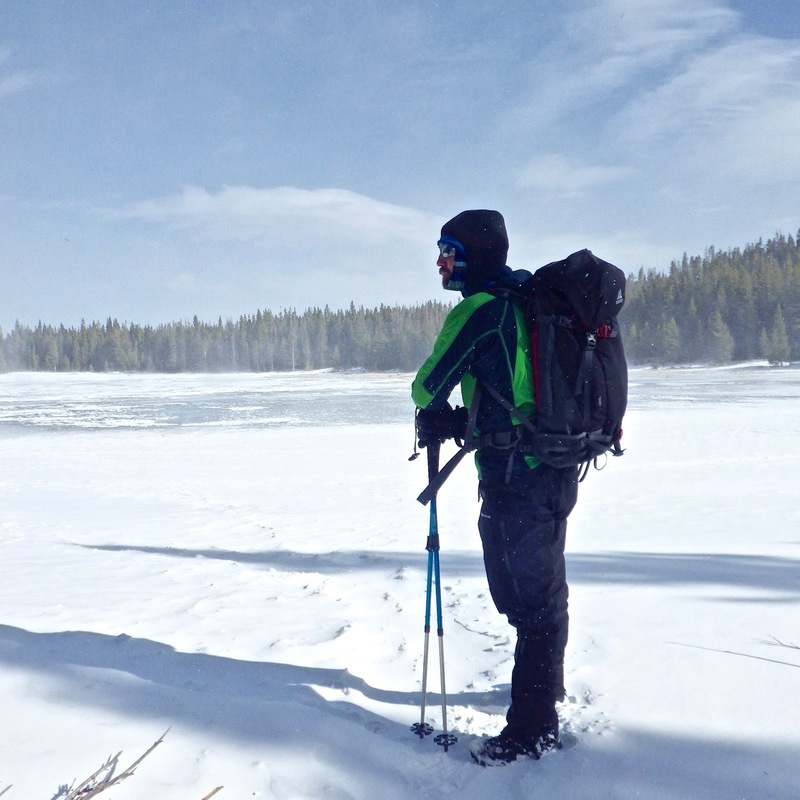 You can make this hike a loop to Cub Lake, but we didn't have enough time. Plus, the rangers warned there may be thick ice on that section, so we didn't take a chance and just did an out-and-back. Our destination was The Pool, a churning water pocket squished between pocket-sized boulders. 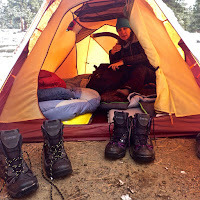 Having survived 3 nights out, I think I may be ready to take it to the next level for a winter backpacking trip ... maybe. We'll see. We also made sure to stop at the historic Stanley Hotel in Estes Park, CO. There is so much conflicting information out there as to how this hotel relates to Stephen King's The Shining. I'm going to go with this backstory (but don't quote me). The Stanley Hotel was King's inspiration for the novel (he allegedly stayed there during a snowstorm and experienced paranormal activity). The movie, "The Shining," used outside shots of Timberline Lodge in Oregon, and some inside shots of Mt. Washington Hotel in New Hampshire. Either way, we've now been to all 3 of these beautiful properties!